CASHMERE — Organizers of the June 1 Red Devil Challenge Trail Run have redesigned the event’s 10-kilometer course to accommodate a road closure in the area. The event’s 25K course remains the same. 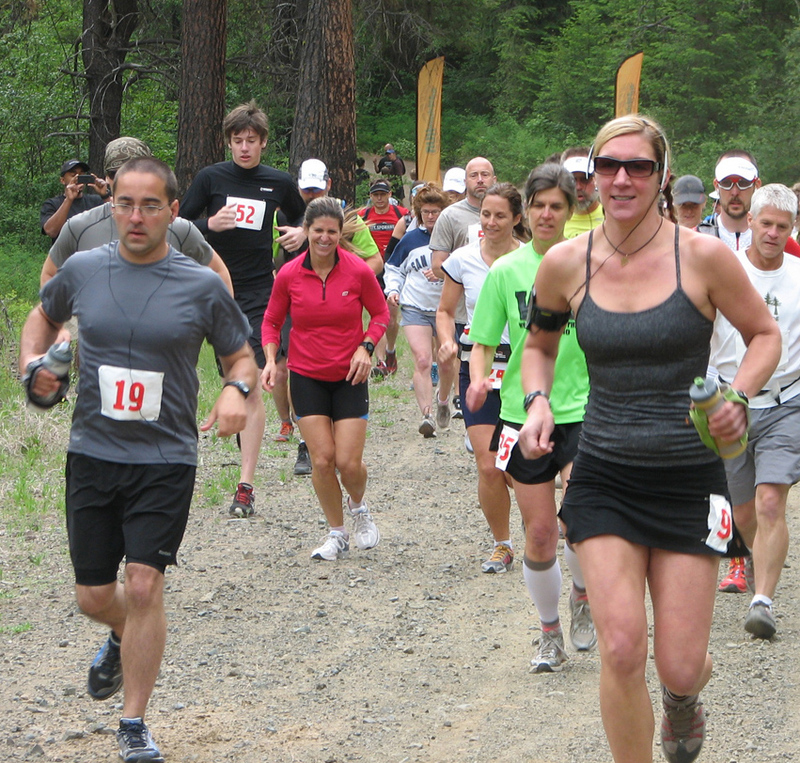 Runners leave the Sandcreek Trailhead in last year's Red Devil 25K race. The 10k run will begin and end at the Sandcreek Trailhead in the Wenatchee National Forest and is a mix of single track trail and U.S. Forest Service roads. There is one long climb, approximately 1.5 miles in length, followed by a 1-mile steep downhill jaunt on a retired Forest Service road. From there, the course features a gradual downhill back to the start/finish area. The final 1.5 miles are on a single-track trail and include two stream crossings. The overall elevation gain over the entire course is about 1,000 feet. “Runners will really enjoy this run,” said race director Joel Rhyner of RunWenatchee, which puts on the Red Devil event south of Cashmere. On May 3, the Forest Service announced it was closing the upper portion of Mission Creek Road — including access to the Devil’s Gulch Trailhead — because of the potential of flooding this spring due to last year’s wildfires that left some hillsides barren of vegetation. The Devil’s Gulch Trailhead had been slated as the starting spot for the 10K run. “In many ways, the closure will make it easier for us and participants because both the 10K and 25K will now start and end at the Sandcreek Trailhead,” Rhyner said. The race has sold out. But runners can still get on a waiting list for the 25K at http://reddevilchallenge.eventbrite.com/#. — The 25K run will start at 8:45 a.m. June 1 and the 10K run will start at 9 a.m. Both had originally been scheduled to start at 9 a.m., but Rhyner said the earlier start for the 25K is needed to reduce congestion on the trail near the start. — Due to the closure of Mission Creek Road, the Devil’s Gulch aid station at mile 9 on the 25K course will be self-serve only. There will be a fully staffed aid station at the top of the Red Hill climb, approximately 4.5 miles into the race. 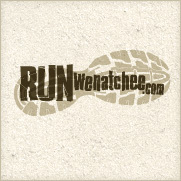 RunWenatchee is recommending runners carry water and nutrition with them. On the 10K course, there will be one staffed aid station. — The 25K course is in good shape and has been brushed and cleared of downed trees by the Forest Service. — Shuttle service will begin loading at 7:45 a.m. June 1 at Milepost 111 Brewery and Restaurant in Cashmere. The buses will leave at around 8 a.m. The trailhead is about a 25-minute drive away. Parking is extremely limited at the trailhead so runners are being asked to utilize the shuttle service. — Packet pickup will be held from 5 to 6 p.m. Friday, May 31, at Arlberg Sports in downtown Wenatchee, and again from 8 to 8:40 a.m. on Saturday, June 1, at the Sandcreek Trailhead. — Others who plan to recreate in the area on June 1 — including mountain bikers, hikers and motor bikers — should note there is a trail run taking place that day, Rhyner said. 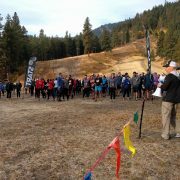 — For more details in the coming days, runners should check the RunWenatchee Facebook page at https://www.facebook.com/RunWenatchee.